Next End Table from Nexera features a closed section with shelf accessible from both sides of the table as well as 2 open sections on one side. Pair the end table with matching Next Coffee Table and Entryway Table (#600739 and #600936) for a complete set. Next Collection from Nexera is characterized by its unique modern design, multiple smart features and quality components. It is offered in a rich black and Walnut finish, with adjustable levelers and proposes modular and flexible settings for your entertainment and home office areas. The warmth and beauty of natural pine and dignified oak will call attention to this magnificent accent piece, with a modern rustic style charm that will impress even the most demanding of guests. The majestic and adventurous essence of a grand oak is captured and put on display with this piece. By utilizing a 2-tier design with painted black iron sides, there's more than ample room to store books, magazines, or anything else that you've deemed worthy enough to house within such a graceful display. Old world tradition meets clean, contemporary design in this stylish coffee series. With a beautiful deep walnut finish, the plank-style tabletop feature studded edges for a hint of industrialism. The tabletops provides plenty of space for daily living essentials and decorative items. Supported by slanted legs and clean lines, this set creates a unique design to be adored. Next End Table Next End Table from Nexera features a closed section with shelf accessible from both sides of the table as well as 2 open sections on one side. Pair the end table with matching Next Coffee Table and Entryway Table (#600739 and #600936) for a complete set. Next Collection from Nexera is characterized by its unique modern design, multiple smart features and quality components. 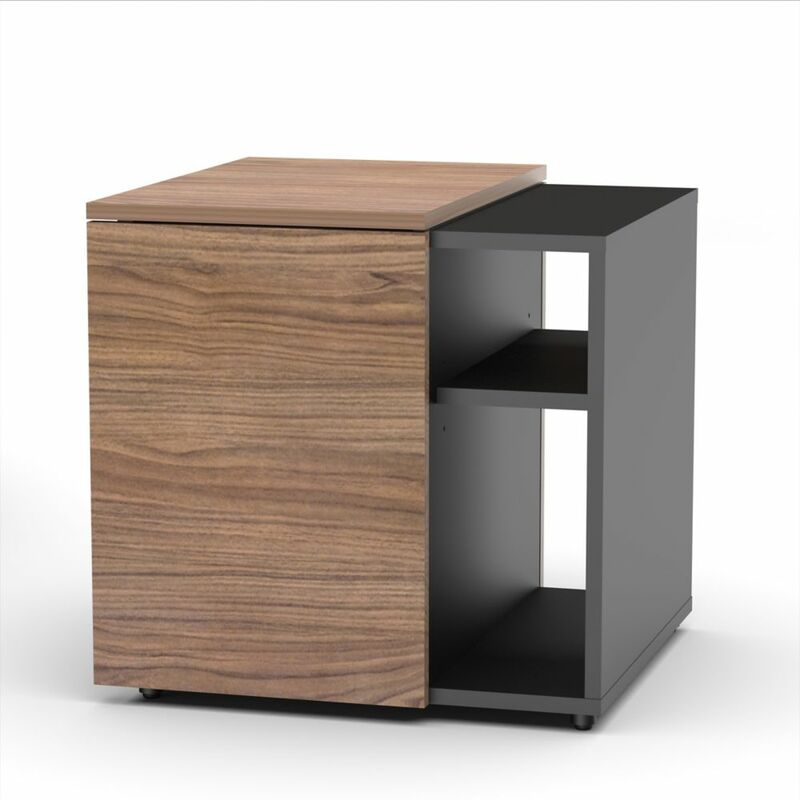 It is offered in a rich black and Walnut finish, with adjustable levelers and proposes modular and flexible settings for your entertainment and home office areas.